Sunday May 1, 11-2: Native Plant Sale and Education at Whole Earth Center in Princeton. I'll be there to spread the good word, along with Wild Ridge Plants, the NJ Native Plant Society, and others. Sunday May 1, 4-6: Gala Event at DR Greenway. My band, the Sustainable Jazz Ensemble, will be performing. This is a ticketed event. Check the DRgreenway.org website. Saturday, May 8, 8am: Washington Crossing Audubon annual spring bird walk at the Institute Woods. Scroll down at this link for details. A letter I sent recently to the Town Topics newspaper in Princeton struck a nerve. It was about a pretty but very aggressively spreading nonnative flower called lesser celandine. One reader, I was told, even printed the letter out and distributed it to her neighbors, in hopes that they would take a look in their yards, and take action before the plant took over the neighborhood's flower gardens and lawns. 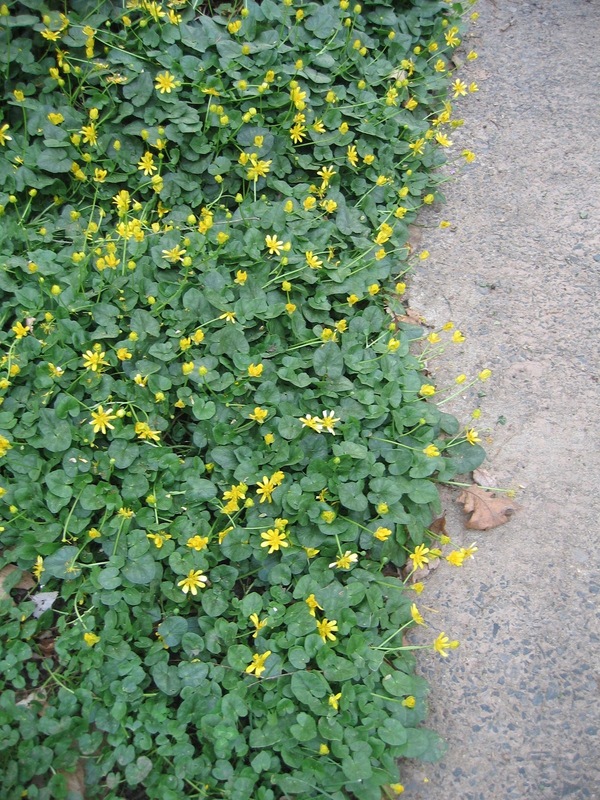 My next post on the subject was going to be a critique of You Bet Your Garden, the widely heard radio program, whose website posting on lesser celandine is full of misinformation. It's both fascinating and alarming to see how even a supposedly authoritative source like Mike McGrath can end up spouting nonsense, which then spreads to listeners, one of whom in turn further spread McGrath's misinformation in a response to my letter published in the Town Topics this week. As with climate change, the intimidating reality of invasive species has led many people to seek refuge in denial of either the problem or the solution, or both. If you’ve noticed a little yellow flower starting to take over your lawn and garden, you aren’t alone. Appreciation soon turns to distress as the plant spreads to become a form of green pavement, outcompeting other plants, then leaving the ground bare when it dies back in early summer. It has lots of names—lesser celandine, fig buttercup, figroot because of its fig-shaped underground tubers, or the scientific name Ficaria verna. Like many introduced species, it gains competitive advantage by being inedible to the local wildlife. Along with nonnative shrubs that wildlife also avoid, like honeysuckle, winged euonymus, privet and multiflora rose, lesser celandine prevents solar energy from moving up the foodchain from plants to insects to birds. This foiling of natural processes effectively shrinks the acreage of functional open space Princeton has worked so hard to preserve. The most dramatic example of this plant’s dominance locally is in Pettoranello Gardens, from where it has spread downstream into Mountain Lakes Preserve. That situation is beyond control, but in homeowners yards, and many local parks and preserves, early detection and treatment can nip invasions in the bud. I’ve been encouraging homeowners and the town rec. department to take this work seriously, because one small infestation can quickly spread to affect downhill neighbors, parks and preserves. Effective treatments can be found online, but typically consist of using 2% glyphosate, the active ingredient in products like Roundup, the wetland-safe Rodeo, and other similar formulations. As with the abuse of antibiotics by the meat industry, glyphosate is now vastly overused to grow bio-engineered corn and soybeans. That abuse has in part driven a demonization of herbicides in general. But just as antibiotics remain a critical medicine, various herbicides remain a critical means of dealing with invasive plants. Personally, my avoidance of herbicides is nearly total, but in the case of lesser celandine, with its tuberous roots, no other approach is practical. Only if there are just a few plants can one dig them out, bag them up and throw them in the trash, not the compost. Adding to the distress of these radical transformations of our landscapes is a strange narrative that is showing up in places like the New York Times and the radio show You Bet Your Garden. Through a denial of both the problem and the solution, reminiscent of climate change, it claims that we should learn to love invasive species, and hate those who dare to take action against them. This view cheats us of the deep satisfaction of identifying a problem and working together to solve it. This past weekend, as part of my work for Friends of Herrontown Woods, I was able to convince a couple neighbors of the preserve to treat their lesser celandine. By doing so, they will not only spare their own yards but also the stream just down the hill. As a bonus, I got to meet some new neighbors. By taking our local nature’s problems seriously, we also build community. After weeks of inaction, paralyzed by inertia and wondering if once again the garden would bowl me over with its growing power, I finally ventured out with gloves, dirt-friendly clothing, and some clippers to take on some of the backyard's longstanding "issues". To my surprise, there was satisfying progress to be made, that actually built on progress past. Many gardeners have "border issues", that is, plants invading their yards from their neighbors', or vice versa. A friend recently showed me how lesser celandine was continually spreading into his yard from his uphill neighbor, and there are many stories of bamboo's indifference to society's artificial boundaries. For years, my yard had waves of english ivy coming in from three sides, but two of my neighbors, without my saying a word, got rid of all of theirs. And where my yard abuts the park in back, I was able to get rid of the parkside ivy by taking the liberty of mowing it, after which the parks crews apparently have been weedwhipping any resprouts. Taking advantage of the soft soil after yesterday's rain, I finally took on the legacy of ivy on my side of the fence, using physical means. The first phase was an on-hands-and-knees approach, pulling and cutting off any ivy growing on the fence. Ivy heading up a tree got cut at the bottom. No need to pull it down. Cutting at the base is enough, though some people find it more satisfying to pull it all off. For phase two, large pieces of cardboard were placed along the fence, overlapping, and any ivy still exposed further in was pulled out and thrown on top of the cardboard, where it will dry out. Some native vines--virginia creeper, wild grape, and poison ivy--were pulled as well, though the main goal was to eliminate english ivy. Gloves, long sleeves, and periodic washing of any potentially exposed skin with water should be enough to avoid poison ivy's effects, but we'll see. The chickens came over to inspect my work, and seemed satisfied. Phase three would be to cover up the cardboard with chips or some other organic material that will hide the cardboard and keep it from getting blown by the wind. But the cardboard will quickly disappear behind a screen of growth in the yard, and some exposed cardboard may prove instructive to park users, who may decide to try using cardboard to deal with their own border issues. Elsewhere in the yard was additional proof of how even intimidating weeds can be controlled by timely intervention. Only a few garlic mustards came up this year, because they've been getting pulled each spring before they go to seed. And the big bamboo patch that once was advancing across the fence on the north side is down to a few weak sprouts easily cut. Other weeds--the Canada thistle and the dandelions--got the undercut treatment with a shovel. There is, of course, the option of eating the young leaves of garlic mustard, and I saw a chinese woman inspecting some bamboo clones across the street, in search of bamboo shoots. Some of the more aggressive native species got a rebalancing. A native floodplain species of goldenrod that spreads via underground rhizomes got pulled out in places. In the photo is the base of a bottlebrush buckeye--a beautiful native shrub that can start grabbing territory once established. It was a relief to discover that its expansionist ambitions are realized via above ground stolons that can be easily cut. Mixed with the pulling and digging and rebalancing was some appreciating, of the subtle pendulant blooms of a Bladdernut, a native shrub found in only a few isolated spots in Princeton. On Sunday, May 1, 11-2pm, the Whole Earth Center in Princeton will have a native plant shindig. That's what Alex Levine, Whole Earth's master artisan of deli cuisine calls it. The official title is "Landscaping With Native Plants", and will feature native plants for sale and free advice from some of us landscaper, native plant seller, naturalist types. There's more info and a pretty photo of Alex's wildflower garden at this link. some celandine poppy. 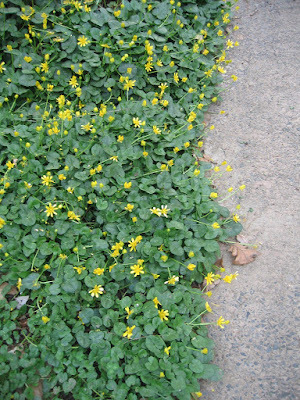 Unrelated to the lesser celandine that's radically spreading through gardens, parks and natural areas of Princeton, the celandine poppy is in the poppy family, makes small mounds that look good even when they aren't blooming. New ones pop up nearby, but not in a way that threatens to take over or spread unwanted into the neighbor's. and the domesticated view in front of the corncrib. Sally Tazelaar, of our Friends of Herrontown Woods nonprofit, cleared the multiflora rose that had obscured the daffodils for years. One of my favorite views is very small and mundane-looking, belying its ecologically significance. Here's evidence that deer are browsing on the smaller shoots of winged euonymus, an all too dominating, nonnative species in some areas of the park. The winged euonymus has been outcompeting native shrubs in part because the wildlife tend not to eat it, but we've noticed that if we play the role of extinct megafauna, by cutting down the winged euonymus too big for the less-mega deer to reach, the deer will browse the resprouts and thus reduce the nonnative's unnatural competitive advantage. There's a good feeling in this collaboration with deer, though they don't seem to have developed a taste for privet or Asian photinia. For those, it's completely up to humans to do the browsing, if some semblance of ecological balance is to be restored. Another quiet, welcome sight is water trickling out of a long-abandoned drainage pipe. It's a spring of sorts, fed by seepage from the ridge. Typically one finds more native plant diversity in the vicinity of a spring, because it provides the stable soil moisture of a pre-drained America, where wetlands and all the native species adapted to them once prospered. Mosses, Equisetum, jewelweed, and even what looks like an iris, which would not be found in the more drought-prone, altered terrain elsewhere. We grow all sorts of things here at Princeton Nature Notes, including melodies. Here are some upcoming performances. Click on the links for more info. Most people don't think of Princeton as having a large marsh to look out upon, but you can find such a view by taking Alexander Rd and West Drive to Rogers Refuge, down from Institute Woods. Though owned by the American Water Company, it is open to the public, with trails, a small parking lot, and observation towers. This Sunday, April 10 at 10am, the group that cares for the marsh, the Friends of Rogers Refuge, will host a dedication to honor Louis Beck, "who, in his passion and enthusiasm for birds, inspired many to cherish birds and work for their preservation." "As Bluebirds and Red-winged Blackbirds stake out nesting territory, and leaves begin to emerge on our row of willows, we are getting ready for spring migration at the Rogers Refuge. Thanks to the support of the Washington Crossing Audubon Society, we will soon be installing new informational signage and, in memory of our dear friend Lou Beck, setting up an extensive series of nesting sites for Purple Martins, Bluebirds, Wood Ducks, Tree Swallows and other cavity nesters. Please join us as we dedicate a memorial to Lou Beck and celebrate the coming of spring. On Sunday, April 10th at 10:00 A.M. we will convene at the main platform at the Refuge for a dedication ceremony, refreshments, and a walk around the marsh." On May 8 at 8am, the Washington Crossing Audubon's Brad Merritt and Mark Witmer will lead the annual bird walk at Rogers Refuge. Details at this link. The marsh is kept wet in the summer with the help of a pump that feeds the marsh extra water from the Stony Brook. It's a good example of how a volunteer Friends group can collaborate with town government and the private land owner, American Water, to sustain one of the finest birding spots in the area. The town maintains the pump, and its long-running deer management program has allowed spicebush and other native flora to rebound, greatly improving the nesting habitat for birds. Take West Drive off of Alexander Road near the StonyBrook bridge, and keep left at the fork in the gravel road. There's a special transaction happening across this chain link fence that separates Potts Park from our backyard. The kids in the park have discovered our chickens. Maybe they heard the plaintive call of our duck, and came over to take a look. Though the park has some nice play equipment, a sandbox, ballcourt and a couple picnic tables, one parent told me the main attraction is now our four chickens. I like to think that the chickens are teaching the kids to regard their surroundings with a keen eye, because a chicken is constantly scrutinizing the ground and plants around it, scratching the earth to see what's there. Are farms, gardens and chickens a gateway into the natural world? Follow an environmentalist's genealogy back a generation or two and you'll often find a farm. Our chickens and duck have the run of the place all day, returning dutifully to the coop at dusk. I put some feed out, but mostly they forage for themselves, and so in a sense occupy a spot along the continuum between tame and wild. Such animals can serve as intermediaries, ambassadors, allowing a connection to that living world beyond neat yards and indoor pets, a bridge to the wild that the heart can traverse. Check out the tenth annual environmental film festival at the Princeton Public Library. The festival begins today, then continues Tuesday through next Sunday. Films day and evening. Many of the films include discussions afterwards with makers of the films. Trailer for the festival below. Princeton Environmental Film Festival 2016 Trailer from Princeton Public Library on Vimeo.